Background: Pullulan is a neutral exopolysaccharide produced aerobically by a yeast-like fungus Aureobasidium pullulans. The distinct linkage of α (1 → 4) & α (1→ 6) in pullulan impart its nonimmunogenic, non-mutagenic and non-cancerous traits. These characteristics are being exploited in food, health care, pharmacy, lithography, cosmetics. During the last four decades, pullulan has had a breakthrough in diverse fields including gene delivery, wound healing, nano-technology, diagnostics and also in human reproductive health. Objective: The present review focused on food grade pullulan, its derivatives, and their applications. 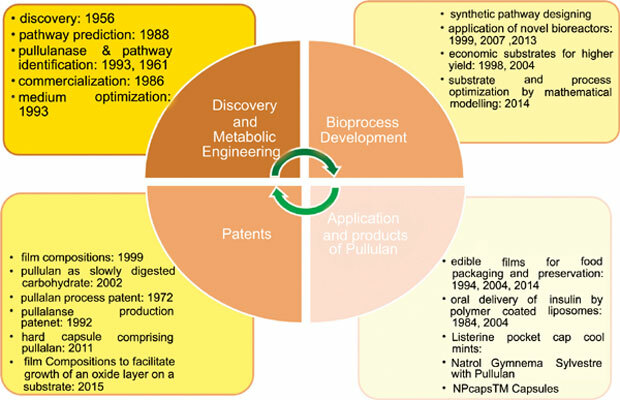 Methods: Deviations in biosynthesis and downstream processing of food grade pullulan have been reviewed in detail. Results: Pullulan can be used for a variety of applications. The food applications of pullulan powder and film have been thoroughly validated. Pullulan film, being carbon neutral, sustainable, biodegradable and palatable, provides a superior substitute to conventional petrochemical polythene films. Pullulan films could be modified to add a variety of special features. These formulations have clearly demonstrated the significance of pullulan, and its potential for more applications. Aureobasidium pullulans, pullulan, pullulanase, food grade, exopolysaccharide, fungus.